Good news, everyone! Quake is now legal in Germany! German gamers sure are a lucky bunch these days. 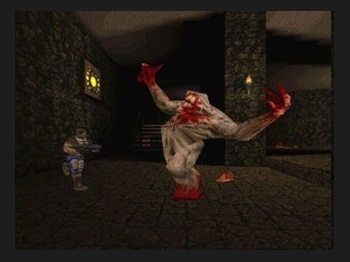 In August you were finally cleared to play the famous id shooters Doom and Doom 2 and now, just a few months later, comes word that you're allowed to play Quake! That's hot stuff! Let me give you the lowdown on what you've missed. Quake isn't the most coherent shooter ever devised but it's a technical marvel - or at least it was back in 1996. Its fully 3D engine was unprecedented and while the single-player experience was a little iffy, it absolutely revolutionized online multiplayer gaming, particularly with the Team Fortress mod, which introduced the world to class-based team battles. You guys are going to love it. According to the Google-translated Heise Online, publishers of games that end up on Germany's index for youth-endangering media [which is where Dead Island recently landed] can request that they be removed after a minimum of ten years. It's been 15 years for Quake, but better late than never, am I right? Having made Doom and Quake safe for German citizens, Bethesda reportedly now has its sights set on the Scourge of Armagon and Dissolution of Eternity expansions, which you totally do not want to miss.